Melissa & Doug Deluxe Standing.. Product weight is 14.96 lbs. Multi-use easel to inspire painting, drawing, and countless ways to play creatively Includes dry-erase board, chalkboard, locking paper-roll holder, child-safe paper cutter, 4 easy-clip grips and 2 large plastic trays that can be removed for easy cleaning Paper, paint, cups, paint brushes, and chalk sold separately; works best with 18-inch paper roll Folds flat for easy storage Height adjustable. Ships in Certified Frustration-Free Packaging Inspire your young Picasso with the Melissa and Doug Deluxe Standing Easel. 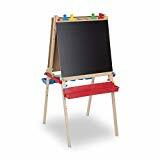 This easel will fuel your child's imaginative side and gives them the freedom to create with an extra-large chalkboard, dry-erase board, and easy-load paper roller. Your budding artist will be inspired by free-form expression and spend hours drawing, painting, sketching, and doodling. It is also an excellent educational item and children love playing school with the chalkboard side. This work station is ideal for kids ages four through 10 and has an adjustable height to accommodate the little ones as they grow. I did some research before purchasing this easel for my son's 2nd Bday. I wanted something durable,fun and would be age appropriate for a 2 & 6yr old. Reading some of the other reviews of this easel I was a little sceptical, however it had all the items I was looking for. Plus it was one of the ONLY easels that adjusted to height. All I can say is I'm glad I ignored the negative comments and bought this. For those of you on the fence let me tell you we've had NO problems .. This easel is a great buy! Very sturdy and high quality as most of mellisa and doug products. Colorful, kid friendly and easy to put together. Both the writing boards and the trays are adjustable for the height of your child. It folds up easy, but stands strong. This easel DOES have a place for a paper roll!! I did not think it did by the amazon description (I almost bought a more expensive one for the paper roll but decided to go with this and am so glad I d..